Akshay Kumar is a staunch supporter of the green agenda, driven to protect and respect the environment. But this time he has gone one step ahead by setting an example for all the litterbugs who don’t respect or care for their country and their surroundings. They say actions speak louder than words. 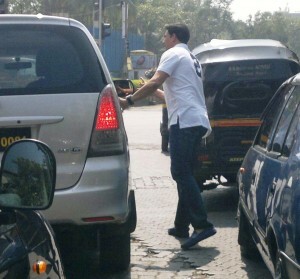 Akshay Kumar disciplined a man smoking in his car during Mumbai traffic, for carelessly throwing an empty cigarette packet out of his car’s window. In the middle of a busy road, Akshay walked out of his car and picked up the cigarette packet and returned it to the litterer embarrassing him for his action. Akshay who abides by the principles of healthy living, urged people who create unhealthy environments to stop smoking and littering the streets and their surroundings and not to abuse the country they live in but work towards the betterment of society.